I live one block away from the kitchen supply store, Sur La Table. This can pose some problems ... for my wallet. I am often tempted to go in there. I can always justify buying kitchen gadgets that are totally unnecessary. I'm really good at justifying buying things that I do not need. I really need this cute heart-shaped pot holder. I really need another pink blazer. I really need this dog-shaped cookie cutter. I really need these polka dot socks. look ... they're on sale! I really need a bundt pan. No, I really really need a bundtlette pan. I ended up with a bundtlette pan on totally legit terms. Yes, a bundtlette pan. 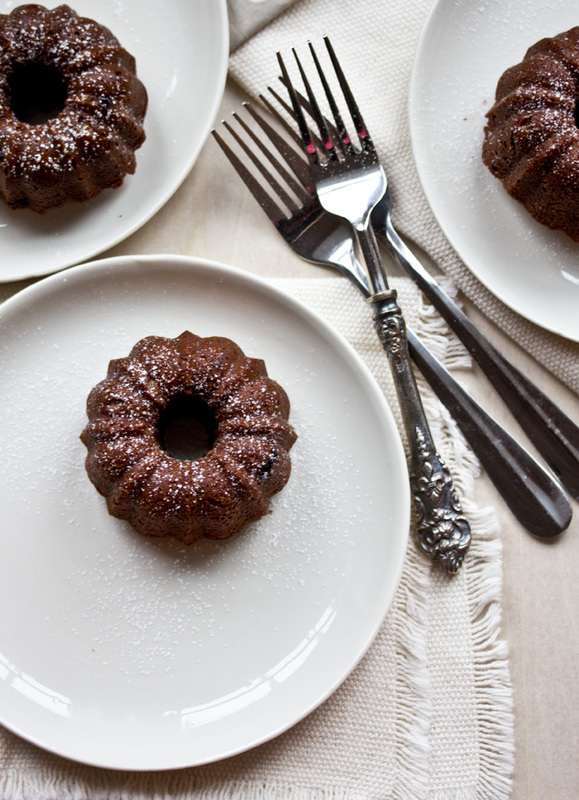 You know, because every kitchen needs a mini-bundt pan. I had bundt cakes on my mind for about two weeks, I really needed to make some. I had also been daydreaming about olive oil cake ever since I had a giant slice at a friend's birthday party. I went into Sur La Table with full intentions of getting a regular ole bundt pan, but then this little guy jumped out at me. I love miniature versions of things, don't you? Olive oil cake might be the best type of cake on the planet. Super moist, really flavorful, and it gets there without the use of butter or milk. I wanted to come up with a gluten-free and vegan version because I figured that the olive oil really takes care of a lot of the things that the butter and eggs would do, and switching out all-purpose flour for some brown rice and almond flour might actually add to the flavor. These little cakes are so good, you could make them for anyone. Gluten-free, vegan, anti-vegan, dessert loving, non-dessert loving, I think there is a very good chance they will all fall in love. Blood oranges are my favorite fruit from citrus season. They are such a beautiful color, but their real treat is their taste. They are just slightly sweeter and little less tart than a regular orange. When I come across them I buy them by the dozen. Soo good. If you cannot find blood oranges, you can substitute regular oranges or any other kind of citrus. Meyers lemons would be great too. And, if you do not have a bundtlette pan, you do not have to go out and buy one. You can make this in a regular 9" cake pan. But of course if you want to seek one out, I give you permission - it is totally justified. Prepare the bundtlette or cake pan. Grease the pan well with some oil. In a food processor, pulse the pecans until they are finely ground. In a large mixing bowl combine the dry ingredients: the ground pecans, brown rice flour, almond flour, baking soda and sea salt. Stir and combine. Make a well in the dry mixture and add in the blood orange juice, zest, extra virgin olive oil, apple cider vinegar, and dark brown sugar. Mix by hand with a large spoon until all of the ingredients are combined. Spoon the batter into the prepared pan, filling the tins about 3/4 of the way to the top. Same if you are using a cake pan. Bake for 30-35 minutes (note: If you’re making the cake, it might take a little more time, 40-45 minutes.) When you insert a tester it should come out dry (if it is wet they are not ready). Let cool for 10-15 minutes before removing from the pan. Dust with confectioners sugar before serving.